• For quantitative determination of peroxidase activity. • Fast and sensitive. Use as little as 10 μL samples. Linear detection range: colorimetric assays 2 to 50 U/L, fluorimetric assays 0.1 to 5 U/L peroxidase. ROOR + electron donor (2 e-) + 2H+ → ROH + R’OH. 1. Jawed H et al (2010) N-(2-hydroxy phenyl) acetamide inhibits inflammation-related cytokines and ROS in adjuvant-induced arthritic (AIA) rats. 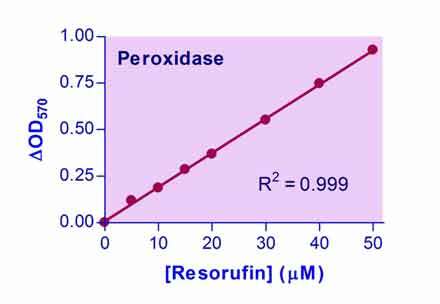 Int Immunopharmacol 10(8):900-5 Assay: Peroxidase in rat serum (Pubmed). 2. Yu CL et al (2008) A novel caffeine dehydrogenase in Pseudomonas sp. strain CBB1 oxidizes caffeine to trimethyluric acid. J Bacteriol 190(2):772-6 Assay: Peroxidase in bacterial cell (Pubmed). 3. Nguyen GN et al (2009) Drought-Induced Oxidative Conditions in Rice Anthers Leading to a Programmed Cell Death and Pollen Abortion. Journal of Agronomy and Crop Science 195(3):157-164 Assay: Peroxidase in plant rice anther (Pubmed). 4. Nguyen GN et al (2009) Drought-Induced Oxidative Conditions in Rice Anthers Leading to a Programmed Cell Death and Pollen Abortion. Journal of Agronomy and Crop Science 195(3):157-164. Assay: Peroxidase in plant rice anther (Pubmed).